Howdy howdy, I'm Kahryez, I've been on heresy for a while, I come and go but mostly lurk about admiring everyone else's work. I've had my crons for years and recently reacquired my CSM from my friend. So, I thought I'd post a log of my progress to get me motivated and such to get paint on these models. I've also got crons I'm in the midst of finishing off the collection that I own, I'll be posting bits about them too as well once I get them all together and out again. My plan is to finish what ever is on my desk before moving on to the next thing. 1 chaos lord scattered in there somewhere. This paint scheme I'm using for this army is Heresy's own Dark Talons, a darker blue armor with metal/grey trim and solid white on the right arm, and I make my weapons generally red to make them pop out from the power armor. 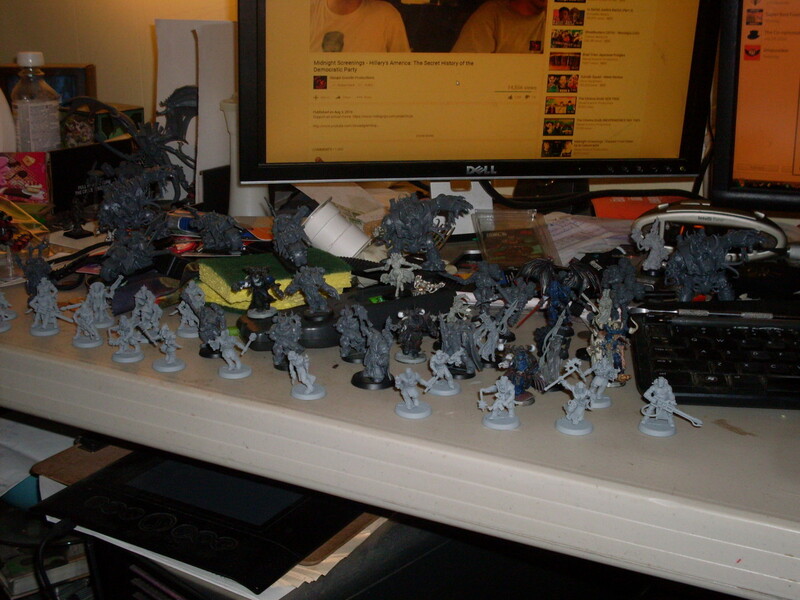 I've also got a load of Khorne bersekers (36 total), as well as 20 more cultists that need assembly. 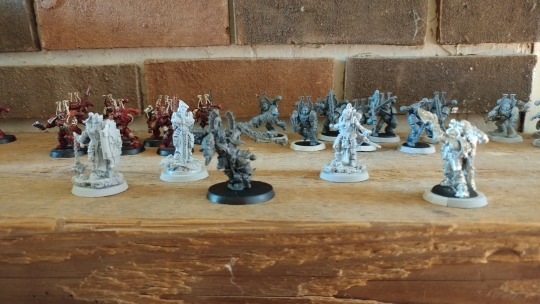 I also have had an idea for a while of making one of the leaders of the Dark Talons from scratch with some of the bits I have coming in the mail. Plus I need another bunch of standard CSM for a formation I wanna try out later >.> but enough of my rambling, I hope you'll enjoy this log the more stuff I put into it as I go along. Last edited by KahRyez; 05-21-17 at 10:33 AM. Looking good so far, I'm excited to see where this goes! "That which we foolishly call truth is only a small island in a vast sea of the unknown. For man to truly flourish, he must be willing to abandon the ever-shrinking island of such petty 'truth' and surrender himself to the reality of that which is beyond." @ExaltedUrizen : Thanks, I aim to please. 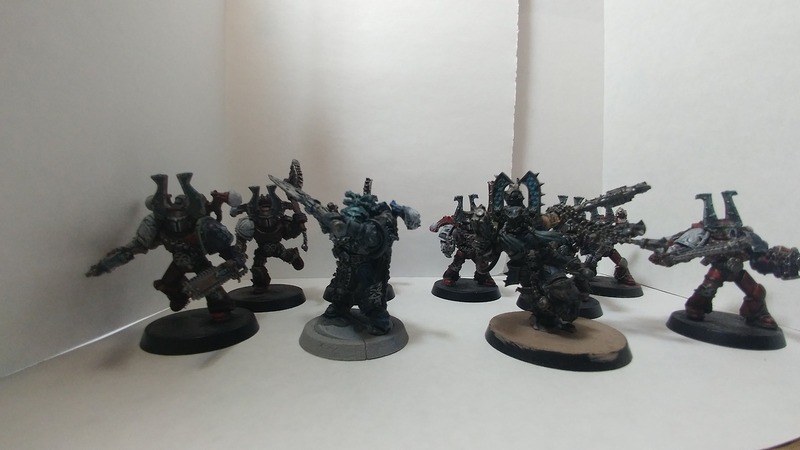 Kharn and his funky bunch(4 skull champs and 28 bezerkers) have become my main focus for now, with the cultists and my custom Dark apostle coming after that. I'm in love with the new book and its' formations, The Maelstrom, Lost and the Damned, and the various formations the Warpsmith is in(Warppack, Cult of D, and The Fist of the Gods), those will likely be my bread and butter until I get two more CSM units to complete the warband formation as well. Last edited by KahRyez; 05-21-17 at 10:32 AM. Slow going as it were, due to not having much time or motivation to paint, but I got Kharn done as least, well, a few more touches might be needed, but here he is I think the next thing I'll work on is his personal squad, which will have the metal skull champ with it. neferhet and ExaltedUrizen like this. 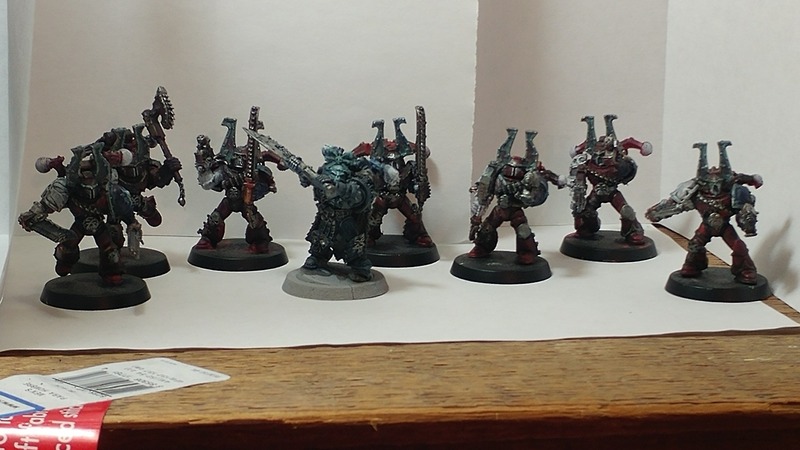 The berzerkers colors are mostly red with one white arm and one blue to tie them into the rest of the armies color scheme(blue armor, black highlights, and the right arm being white). One down three more squads to go, afterwards I'll get on my cultists and my custom Dark Apostle. the pic is truly bad, my friend they all look black! try some more lighting in the white box? 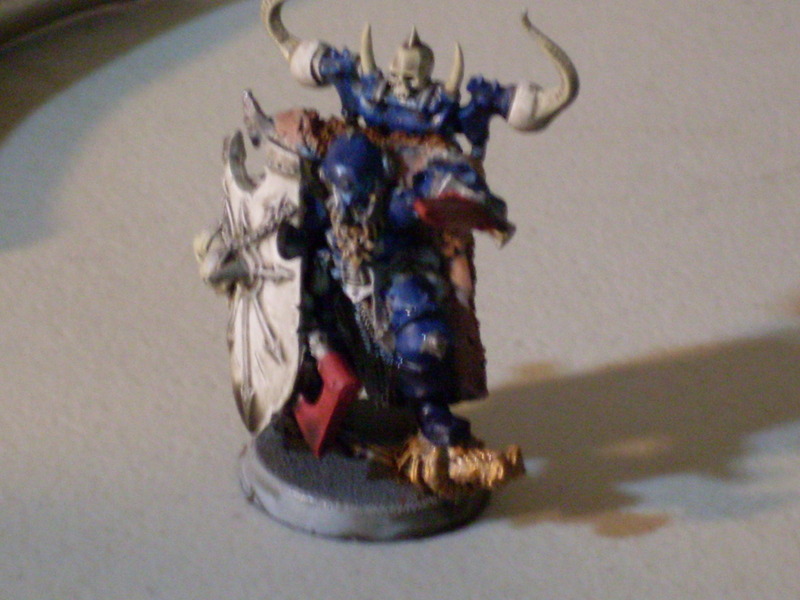 Huh, your right, here ya go, I added a bit more light and pulled Kharn out of the photo. I'll try to put a bit more effort into getting a proper lightbox set up, the current one is a mismash of cobbled together lights in my room. 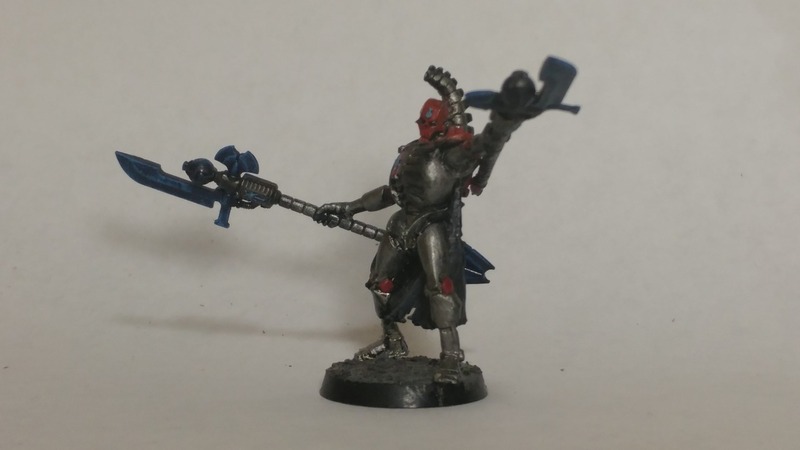 Whelp, with the new codex for the Necrons coming out, I thought it would be a good idea to start the ball rolling again with a refurbished lord I had sitting around, Say hello to a renewed Ini-herit, the herald of my armies. Finishing up some of the last bits on my Death Guard killteam leader The Shepard. 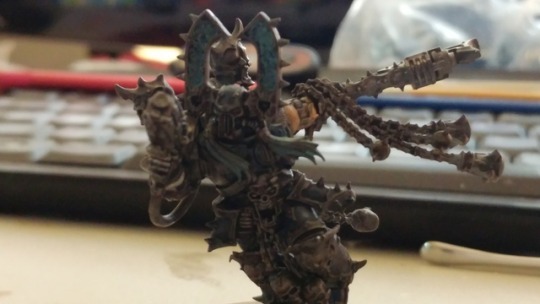 The force he leads is called the Keepers of the Flock, a poxwalker heavy list. 40k kinda took a backseat for a long while during this year, but killteam managed to drag me back in along with my friend. I've got three total killteams prepared and have starting painting up them one at a time when I get the chance. 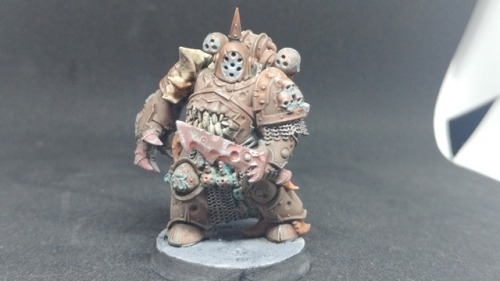 Interesting "pallid" tone for the metals and corrosion; makes a pleasant change from the febrile tones that GW tend to use for Nurgle.